When avoiding Cesarean section, mothers need to promote a progressing labor. One of the things that help labor move along is starting the contractions with the baby in an optimal fetal position. Once a woman is in her 3rd trimester, she can ask her provider what position her baby is in. Identifying a baby who is not head down sooner rather than later, gives a woman an opportunity to encourage her baby to turn while the baby is smaller and there is still plenty of amniotic fluid. The thing to keep in mind is that the babies WANT their heads down. They will respond to encouragement to move to a head-first presentation. The mother can work to change the baby’s position ahead of labor. The mother knows that her labor can be longer or more uncomfortable as a result of the baby’s position. She can plan strategies to employ during labor to cope. There may be other therapies to help with changing the baby’s position like external cephalic version. The birth itself may change based on the baby’s position; for example, if the baby remains breech, the mother may opt for a cesarean birth. A woman should know the baby’s presentation by 32 weeks. Because even the most experienced provider can make a mistake, ask for a quick office ultrasound scan to determine what is up and what is down. If the baby does not have its head in the lower hemisphere, it is a great time to start going to the chiropractor for the Webster technique. 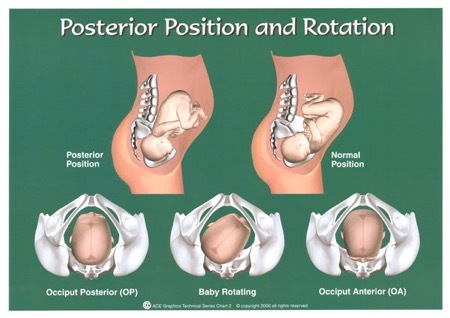 Breech tilts help move the whole baby toward the mother’s diaphragm, away from the restrictions of the lower uterus and pelvis, to help the baby move into a head down position. People need to remember that the baby WANTS his head down so he will respond favorably to the extra room. Pulsatilla 30X is a homeopathic remedy that is believed to encourage a baby to move to its best possible position. Several Pulsatilla tablets under the tongue just prior to doing breech tilts 3-4 times a day. Women can consult with an acupuncturist to help. Pregnant moms can encourage their babies to be head down by doing handstands in a swimming pool. In the winter, a woman can try to get into a YMCA pool by purchasing day passes or even check into a hotel for the weekend. If the breech baby does not turn, the baby can sometimes be turned by a procedure called external cephalic version (ECV). ECV is typically performed in a hospital by a physician. The baby is manually turned to a head-down position by pushing on the mother’s abdomen. This can be painful and a little scary but overall is very safe and substantially reduces cesarean births. Delivering a Breech Baby vaginally is reasonable for certain women, particularly those who have previously given birth vaginally. More than half of external cephalic versions (58%) will turn a baby to a head-down fetal position. Benefits include a significant decrease in the risk of C-section and a decrease in breech positioning at birth. The most common risk is a temporary change in the infant’s heart rate (4.7%); serious complications are rare (0.24%). The evidence shows that it is worth trying to move a beech baby to avoid a cesarean. Babies can be assisted to move to better fetal positions within the uterus that will make the birth easier. Just about everyone has laughed at the expression about a baby being “sunny-side up” but when the head-down baby lays with its back next to the mother’s back (this fetal position is called Occiput Posterior) during labor, very few women (or Providers for that matter) are laughing. The baby needs a lot more space to exit the pelvis; it must extend backward and then flex to navigate the pelvis. This is much more difficult and generally more uncomfortable. Women are said to have “back labor” because of the constant pressure on the mother’s back even between contractions. Babies are rarely born posteriorly; they usually need to turn to get out. This is a circumstance when a skilled and patient Practitioner is beneficial to deliver the baby vaginally. Often, when the baby does not turn, the birth must be accomplished via cesarean section. Forceps can be very helpful because they can be used to gently rotate the baby to an anterior position. The use of forceps is rapidly becoming a lost art in Obstetrics but they are one of the reasons the Cesarean rate was so low in the 1970’s. A woman should perform pelvic rocking in a hands and knees position several times a day. She should take a deep breath, tuck her chin in and arch her back up like an angry cat. Hold for 5 seconds. Then slowly breathe out while bringing her back to a flat position, bringing up her head to face out over 5 seconds. Repeat 10 times or as tolerated. The yoga positions “cat/cow” and “child’s pose” will also help encourage a baby to roll more anterior. Taylor sitting helps to keep the woman’s pelvis rotated forward and encourages the baby to do the same. Using a rebozo to “shake” or rock the baby so it is no longer “stuck” in a posterior position will help the exercises listed above work more effectively. The Midwives of New Jersey use rebozos during regular office visits. Walk up stairs 2 at a time. Lie on your back with a thick towel rolled in the small of your back for 5-10 minutes as long as you can tolerate it. This can cause a baby in a posterior position to hyperextend its neck, which is uncomfortable so the baby will turn. The third way a baby can be in a less than optimal fetal position is the way the baby’s head enters the pelvis or the position the head assumes when forced deeper into the pelvis. So the head can be in the pelvis and facing down and still not be quite right. Asynclitic means the baby’s head is tipped with its ear toward its shoulder. Sometimes it is because a small baby has too much room or alternatively a bigger baby is trying to find its way through a tight space. If a baby sits in an asynclitic position for an extended period of time, it may have torticollis when born (a condition where the baby’s neck is asymmetrical with one side of neck muscles tight and the other side stretched). When the baby’s head is not well-flexed, the baby needs significantly more space to move through the curves of the pelvis. The baby is like a stick trying to make a right turn in a tight space. The baby is better positioned like it is going to do a somersault through its mom’s pelvis! This is partial and full extension of the fetal head is very uncommon. It is often a cause for cesarean delivery because these fetal positions are difficult to change once the head is in the pelvis and the baby needs A LOT of space to extend through the pelvis. All of these less than perfect fetal positions can deliver vaginally and sometimes with no sign of anything abnormal happening. The baby is born and has a lump on the side of its head and we know the head was asynclitic. But for most women, these awkward positions make labor longer and harder. 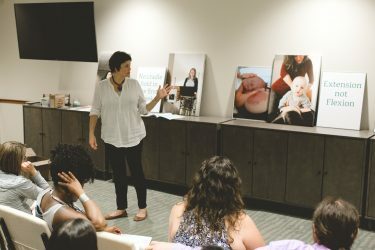 Gail Tully CPM of Spinning Babies recommends mothers assume certain positions during pregnancy and during labor that will facilitate babies to lay with their head down and flexed and their back to the front. The Midwives of New Jersey have been recommending the Spinning Babies website for years. Less than optimal fetal positions sometimes result from the mother’s lack of abdominal muscle tone and the separation of the muscles called diastasis recti. Lax muscles do not hold the uterus with the fundus (the top) up by the mother’s ribs, rather the fundus falls forward and sticks straight out the front. This gives the belly the appearance of a bullet sticking straight out or even worse pointing toward the ground. When the fundus falls so far away from the woman’s body, there is nothing to force the fetal head into the pelvis. This allows the baby to float above the pelvis and sometimes change to a breech or transverse (sideways) position. When the baby does descend they are sometimes deflexed which makes a brow or face presentation more possible. The risk for umbilical cord prolapse is greater when there is no large baby part (head or bottom) filling the pelvis. The Midwives of New Jersey often recommend the mother wear an abdominal binder when she is up and around during the day. During labor, Midwives will often hold the uterine fundus up and into the mom’s abdomen during contractions. This a time when a midwife might ask a woman to lay on her back at a 45-degree angle to keep the uterus in its proper position. What do You Notice About These Bellies? “The ideal angle for the axis of a full term fetus falls somewhere between 55-60 degrees, as shown in the photo below. In the photos above, the green line represents the approximation axis that is ideal for baby, and the red line indicates the approximate actual position of the baby” (Source). In labor, a woman who can move freely will instinctively move in a way that will open or change the pelvis to allow the baby into a more positive position. Also, skilled Providers will know how to encourage a woman to move her body to help make these changes. If a woman needs an epidural to tolerate her labor, made longer and harder by the baby’s position, it is still possible for the mother’s position to be changed to cause a change in the baby’s position or in the pelvis. Many women with epidurals can get on their knees on the bed using a birthing ball and maybe her partner for support. Labor and Delivery nurses routinely turn a woman from one side to another to aid in the baby’s descent. Recently, many hospitals have incorporated the use of a tool called a peanut ball. 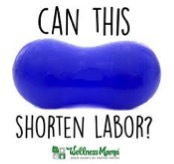 The few studies that have been conducted about the peanut ball have shown it to reduce the hours of labor and the number of cesarean sections possibly by altering the shape of the pelvis in a more radical way than just putting pillows between the laboring woman’s legs. All women should be sure their hospital has birth balls available to them, regular ones and peanut balls. Sometimes babies won’t move. And they certainly CAN make their way out of their mother even in an awkward position. Laying in a posterior position can cause back labor or a slow labor but sometimes a baby is born face-up with no fuss or muss. The best way for a woman to approach these suggestions is with a positive attitude. Even if the baby remains in its current position, the Mother will accomplish the birth. By taking the time to prepare for the birth mentally and physically, even if the baby never moves, she has added to her toolkit of coping mechanisms she will take into her birth.